One major difference in gay rodeo events is that men and women compete in parallel events. 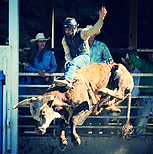 At a gay rodeo you will see women bull riders and men participating in barrel racing. We also have some very exciting "camp events" you dare not miss!! 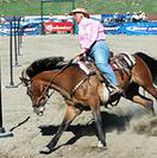 Many of the contestants on the IGRA rodeo circuit do not own horses. This event allows anyone an opportunity to try their skill at throwing a lasso over the head of a calf. The contestants are allowed a maximum of 20 seconds to make a qualifying catch. Timing starts when the calf leaves the chute. A qualifying catch takes place when the loop passes over the head of the calf and lands around it's neck. When the slack in the rope is pulled tight, the contestant releases the rope. The judge will then drop a flag to stop the time. This competition requires a two person team. One member stands ten feet away from the chute gate, holding the end of a 25 foot rope which is looped around the steer's horns. The other team member waits forty feet from the chutes, holding a 24 inch long ribbon. When the chute gate opens, the team must coax the steer across the ten foot line. Next one team member tries to tie the ribbon on the steer's tail, while the other removes the rope from the steer's horns. When the ribbon is on the tail, and the loop is off the horns, the team member who tied the ribbon, must tag the timing official to stop the clock. The team must tie the ribbon, dislodge the rope, and tag the timer within the two minute, maximum time limit. I suppose a ribbon on the tail could be considered a fashion accessory! Team Roping was a necessity on the cattle ranch, long before the cowhands began competing against each other at rodeos. When larger cattle became sick while out on the range, it was not possible for one cowhand to safely rope the animal for "doctoring". 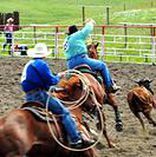 Team Roping is a timed event with two ropers – the "header" and the "heeler". When the steer leaves the roping chute, the header follows and throws the loop around the steer's horns or neck. The heeler can then throw a loop to catch both of the hind feet. The ropers' horses must be facing the steer, with the ropes taut, before the judge drops the flag to stop the time. If either roper enters the arena before the start judge drops the flag, they will receive a ten second penalty on top of their time. The heeler can also incur an additional five second penalty, if only one hid leg is caught in the loop. The team can throw a maximum of three loops in order to make the two necessary catches: head and heels. Team has a maximum sixty (60) second time limit. An entry level event for new cowboys and cowgirls. Contestant uses an approved rigging that has a braided flat rope with a flat braided hand grip, and a loop with a bell. This rigging is looped around the chest area of the animal. A steer is a less aggressive animal and skill set. The Stock Contractor flanks his animals with a soft cotton rope around the back end of the bull that signals the animal to buck. When contestant is tied in and ready, they signal for the Chute to be opened. They must stay mounted and in control for six seconds. They can only ride one handed, and the free hand cannot touch themselves or the animal. Rider is scored 50% on their ability and skill, and 50% on the skill of the animals. 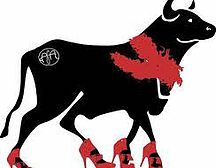 Spurs can be used to enhance the performance of the Bull, but they must not be sharp and must be locked rowels. Our Judges verify these on each contestant prior to their ride. This two-person event was created specially for gay rodeo. At one end of the arena stands the adversary – a goat tethered by a 10 foot rope to a heavily weighted object. An official holds the goat at the end of the rope, furthest away from the contestants' start line. Fifty feet from the tether point, stands the two person team. One team member wears a pair of jockey-type underwear over his/her forearms. When the start whistle sounds, the goat is released, and the team runs to the animal. The member, without the undershorts, picks up the goat's hind legs. The team-mate, grabs hold of the goat's hooves. The first team member grabs the waistband of the underwear, and pulls it up the legs of the goat. Both people then race back to the start line. To qualify, the undershorts must stay over the tailbone of the goat, until both contestants cross the finish line. While this event is usually quite fast paced, it is still subject to the two minute time limit of all camp events. 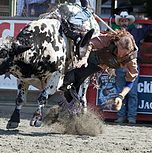 Chute Dogging, or steer wrestling on foot, is another arena-born event where the contestant races the clock to wrestle a 400 to 500 pound steer to the ground. As the chute gate begins to open, the judge will blow a whistle to signal the start of the timing watches. 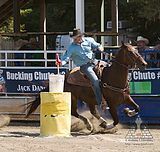 Before the contestant can "dog" the steer, the animal's four feet must cross a line ten feet from the chutes. This is for the safety of the contestant and the steer when falling to the ground. 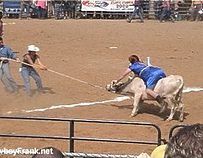 After crossing the ten foot line, the contestant takes a firm stance, and the steer is wrestled to the ground by turning the steer's head back toward its shoulder. 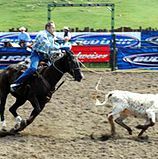 When the steer is lying on its side with all four feet pointing in the same direction, the judge will drop the flag to stop the timing watches. Contestant has 60 seconds to dog steer. Contestants vie for the fastest time by racing their horse around three barrels set up in a cloverleaf pattern. The horse and rider are allowed a running start, and time begins and ends when the horse's nose crosses a set line across the arena. The contestant may choose to run the course starting with either the left or right hand barrel and follow the cloverleaf pattern. A five second penalty will be added to the time for each barrel that is knocked over. If the horse does not follow the required pattern, the contestant will be disqualified. And finally, the contestant is required to wear a western style hat. It's loss, while in the arena results in a $5.00 fine. The Flag Race is a contest of speed, control of the horse, agility, and aim of the rider. The course is set in a triangular pattern, the same size as for the Barrel Race. Instead of the top end barrel, a pole is used. The contestant may choose to run the course starting with either the left or right hand barrel. The rider plucks a flag from a bucket of feed pellets at the first barrel, then races around the pole, and must plant the flag in another bucket at the second barrel. 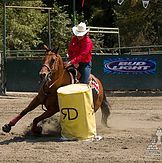 Knocking over the first barrel, bucket, or the pole each results in a five second penalty. The contestant will be disqualified for knocking over the second barrel, second bucket, or if the horse does not follow the required pattern. The flag must stay in the second bucket to receive a time. The Wild Drag Race includes three people on each team: one male, one female, and one person in "drag". The "drag" may be either a man or a woman, but must wear female type "drag" clothing, and a wig. As with most drag competitions, the costuming can be quite outrageous. The steer is in the bucking chute with a 25 foot length of rope attached to a halter. The cowgirl stands 10 feet in front of the chute holding the rope. The cowboy is 40 feet from the chute, and the drag is 70 feet from the chute. When the gate opens, the team tries to direct the steer towards the 70 foot line. Once all four hooves are across the 70 foot line, the drag may then mount the steer. The team must then turn the steer around and point it back toward the chutes. Time stops when all four hooves with the legally mounted drag cross the 70 foot line in the direction of the chutes. As in all Camp Events, there is a maximum time of two minutes for completion of the ride. 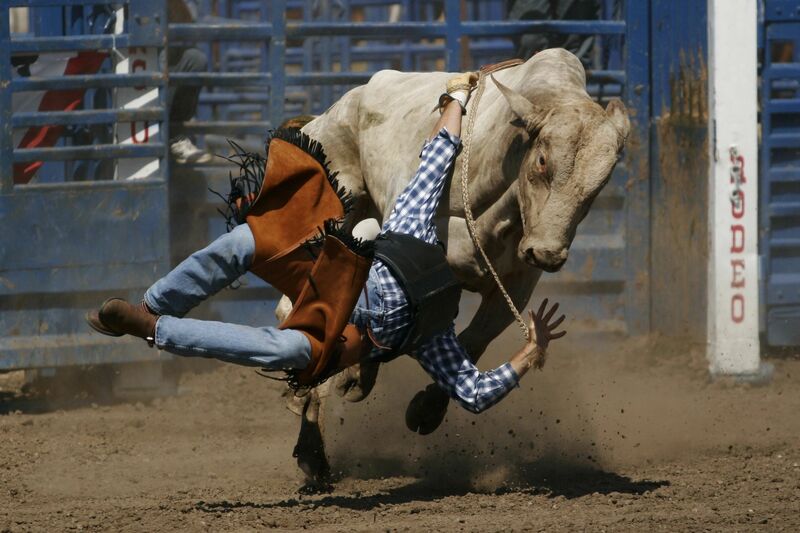 All rodeos have at least one event that makes the crowd laugh. The most common example is Mutton Bustin' where a young child attempts to ride a full grown sheep bare back. While Gay Rodeo does not include events for the younger folk, it does include the humorous Camp Events. These events serve three purposes. First, they are fun to watch, making the crowd roar with laughter. 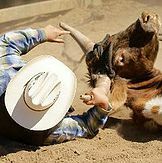 Second, as they require no livestock experience they are often a way for contestants to get their first taste of Gay Rodeo. Some contestants start here and go on to compete in the Traditional Rodeo events. Finally, in some ways they are designed to poke fun at stereotypes of the Gay community. Let's be honest, who doesn't know at least one Gay designer, an overly fashion conscious homosexual, or the "traditional" Drag Queen? Competition is often heavy in the camp events. As prize money is based on the number of contestants, the Camp Events often have the largest prizes.